Steve Hargadon: The Student Technology Conference - Saturday Schedule and Welcome! The Student Technology Conference - Saturday Schedule and Welcome! Saturday, January 31st, 2015, is a GREAT day for student teaching and learning! Tomorrow, the inaugural "Student Technology Conference" takes place, kicking off at 9:00am US-Eastern Daylight Time. Organized by a team of students from five schools, with four (student) keynotes, and with 21 (student-led) regular sessions, it all takes place online and free at http://www.studenttechnologyconference.com. While attending the live sessions allows you to participate in live chat with the presenters and other attendees, all of the sessions will also be recorded and available for on the conference site. Please forward this post to friends and colleagues and then encourage them to join us for this live event. The current complete schedule is below. Go to http://studenttechnologyconference.com/page/attending-schedule for the conference hour-by-hour schedule in your own time zone and for the actual links to attend each session (the program is shown for 33 different time zones around the world). The keynote speakers presentation descriptions and bios are at http://studenttechnologyconference.com/page/keynotes. Please do help us promote the conference as widely as possible. Sample tweets and blog posts are also at the bottom of this email, below the schedule. Thank you in advance for your support! 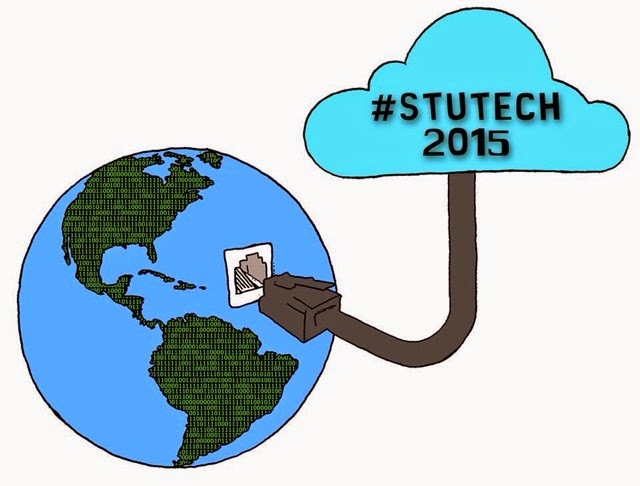 The hastag for the conference is #stutech2015. KEYNOTE: Parth Chug + Ameera Patheria on "Plugged In: A Student Run Digital Literacy Service Club"
KEYNOTE: Sydney Sheren on "How to Help Your Visual Students Learn Using Movie Magic"
KEYNOTE: Isabelle Fitzgerald + Lillian Kennedy on "Say it with Social Media"
KEYNOTE: Dylan de Waart on "Global Buddy—Lesson From a Student Initiative to Connect Schools"
Join me at the 2015 Student Technology Conference, a student-directed global conversation about technology in education, on Saturday, January 31st from 9am - 9pm ET. Hear from students in grades 6-12 as they discuss and share their perspectives on educational technology. Visit http://studenttechnologyconference.com/page/attending-schedule to see the schedule of sessions in your time zone. Share that you’ll be attending on Facebook at http://ow.ly/H8dFZ, and be sure to tweet using #StuTech2015.